Alan Coxon, the UK's leading food archaeologist and celebrity chef was born in Derbyshire before moving to France at the aged twelve. It was this exposure to the French culinary influences that inspired Alan to become a chef. At the age of fifteen, Alan returned to the UK to complete his schooling and found work in several hotels and restaurants during holidays and weekends. He then went on to catering college to complete a formal two-year course. On completion, France and the Mediterranean foods pulled Alan back to work as a Commis and Demi Chef de Partie at the famous Loews Hotel, Monte Carlo. As the only British chef in an international brigade, Alan progressed readily through the culinary ranks, obtaining extensive experience in the multitude of outlets including the Michelin starred Foie Gras restaurant, the Provincial Restaurant Le Pistou and the function suites at Le Follie Rousse. After several years of successful trading, Alan decided it was time to expand and became Head Chef of the Top Table restaurant owned by Robert and Susan Sangster. The restaurant received confirmation of a Michelin star, but was sold by the Sangster's prior to the printing of the new guidebook. Alan was once again lured back to France, this time in the leading position of Head Chef of the Newport Bay Hotel in Paris, the largest four star hotel in Europe with 1098 rooms. Alan lead an international brigade of over fifty chefs, and was responsible for overseeing two à la carte restaurants, one fine dining restaurant, all room service, three large function suites and an outdoor dining terrace as well as all food purchasing and stores. With over 3,000 residents, and a continuous stream of non-residents to cater for, Alan was also responsible for catering for the tastes and requirements of many celebrities such as Michael Jackson, Cher, Sir Bob Geldof, Eddie Murphy, to name just a few. Alan eventually returned back to the UK this time in the role of Catering Lecturer, spending three years writing and developing City and Guilds NVQ packages, and training young people entering the catering industry. 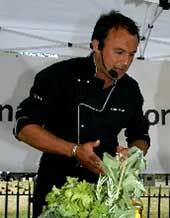 After three years, Alan returned to the industry as Executive Chef for a leading Scottish food manufacturer and it was here that he was instrumental in the development and creation of a culinary food theatre for culinary demonstrations and the overseeing of the catering operations, the gastronomic restaurant and catering for visiting dignitaries such as HRH Prince of Wales and former prime minister, John Major. Whilst delivering shows, Alan was spotted by producer and director, Kirsty Walk, who invited Alan to co-present a pilot cookery show. The pilot tape, together with other material was sent on to Action Time, a production company, who were actively involved with TV cookery shows. 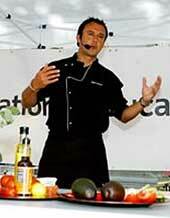 Within the month, Alan was offered a TV series, Surprise Chefs, co-presenting with Lesley Waters. He then went on to do over two hundred and fifty of his own shows entitled, Coxon's Kitchen College, filmed to time, and in front of a live audience. Alan was invited to guest present a cookery section on the first ever Gloria Hunniford's Open House programme live for Channel 5 where he remained a regular contributor to the show for over four years. Alan is presently a guest co-presenter with Jeni Barnett, on BBC UK Good Food Live and is now approaching his second year with the team. His other TV work includes the successful series Ever Wondered About Food on BBC2, which attracted over 1.3 million viewers per programme and indulged Alan's passion for the history and social science of food. The programmes success gave rise to a second series, aired in 2003. In addition to Alan's UK filming, he has also proved hugely successful in South Africa, where several series have been shot, including the unique series of Coxon's Royal Feast, a creation that led Alan into the homes and private lives of Southern African Royalty. Alan's other work has included several food and travel series includingTasting South Africa, A Land of Plenty from the USA and From Portugal with Love. Alan has also featured on many other shows, making guest appearances including, ITV's Naughtiest Blunders, Flash in the Pan, Picture This, Dennis Nordens Laughter Files, Lifestyle Matters, Food Network Daily, Games Room and Super Chefs, to name but a few. Alan has been interviewed and written about in such publications as BBC Good Food Magazine, the Daily Mirror, Conde Nast Traveller, Daily Telegraph, the Times, Family Circle, House and Home, House Beautiful, Restaurant and Hotelkeeper and various magazines and newspapers around the world, where many of his shows have been screened. Alan is an author of three books, the latest is Ready in Minutes published by Struik, preceded by the Singles Cookbook and Three Chefs in the Cape. We all want to eat healthy, fresh foods and today we are keener than ever to focus on diet, balance, vitamins, GM-free and organic foods, to name but a few. In addition to all this, the demands of a hectic business and social life can result in less time being spent in the kitchen trying to attain these goals. 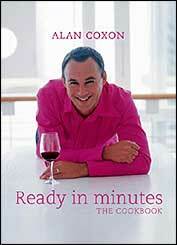 With this in mind, Alan Coxon has put together Ready in Minutes, a collection of healthy, nutritious and mouthwatering recipes geared around the cooking time that we may or may not have - from no-cooking recipes such as Prawn and Mango Salad with Spiced Ginger Dressing, to 30 minute dishes, including Poached Fillet of Beef with Pumpkin-Mustard Cream Sauce. Alan also shares his passion for food, and has included fascinating insights, facts and history about various ingredients. Alan is very much committed to the furthering of food understanding through its origins, including the influences of Roman, Egyptian and Ancient Greek cuisines, and also in encouraging young people towards the profession and also ebncouraging home cooks as well. This includes a variety of initiatives such as visiting schools in association with his membership of the Academy of Culinary Arts, to shows and demonstrations across the country. Alan is also pro-active in promoting regional seasonal foods, healthy and achievable dishes for all to understand and embrace. He is passionate about the hospitality industry to which he has committed his working life, and enjoys sharing his love of food and his knowledge for all to enjoy.